The function of a humidifier is to release water vapor and improve moisture levels in the air. During the winter months, cold and dry air can cause many ailments. Studies reveal that increasing humidity to a certain level can help prevent many airborne viruses that cause flu infections. Which means the right use of humidifiers can help you avoid getting sick due to dry air in the winter. Dry skin or chapped lips are signs that there is a need for a humidifier in your space. The level of humidity in furnace-heated air can be significantly low. 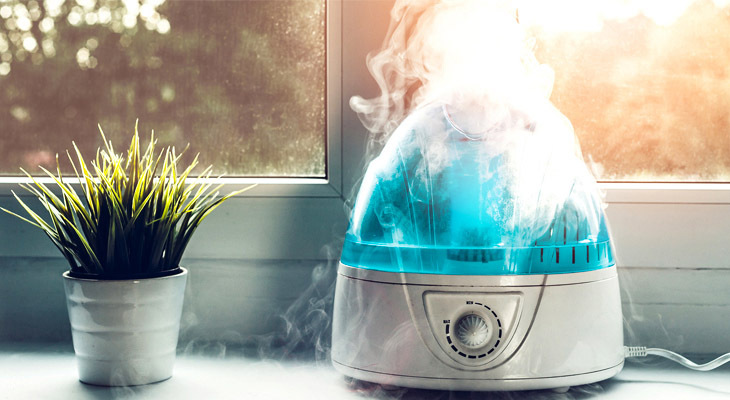 Humidifiers add the much-needed moisture to skin and to the air. You can use several humidifiers in the house and near bedrooms. Improving the quality of air by adding moisture not only treats dry skin but also soothes skin itchiness and dryness ensuring a more comfortable indoor environment in the winter. It’s not just the winter that leads to dry air, there are other factors such as cosmetic products and topical medications for acne that sometimes result in skin dryness. Moisture and steam can help you ease down itchiness in the nose, irritation, sinuses, nasal passages, and itchy eyes. Humidifiers, therefore, benefit people with flu or allergies. The growth of bacteria that flourish in the dry air can be prevented by improving indoor air quality. However, you must be careful when utilizing humidifiers as a tool to improve moisture in the air. Overusing this device can also facilitate the growth of allergens and pathogens. People suffering from asthma can find humidifiers beneficial as it improves breathing especially when a patient is experiencing respiratory infection. However, if you or someone in your family is suffering from asthma, use humidifiers after consulting your doctor. People who breathe through their mouth find it difficult to prevent dryness, especially when they are sleeping. The use of a humidifier can improve the situation in such cases helping people soothe the tissues at the back of their throat. It will help them snore less and sleep more comfortably. Humidified air feels warmer than dry air. Sweat evaporates more slowly with more water in the air making people feel warmer. Maintaining good air quality in your house can help you and your family live much healthier lifestyle. The use of humidifiers also helps you maintain some of the essential components of your home such as furniture, wallpaper, and paint. Consult a heating and cooling expert to know more about how increasing the humidity level in the air can help you prevent certain health-related issues in the winter. Nor Can Heating & Air is a team of highly competent HVAC experts in Edmonton where we help people enhance their indoor environment in terms of cooling, heating, and air quality. From emergency HVAC services to the new installation or replacement of old HVAC units, we deliver a broad range of services. Contact us for more information!